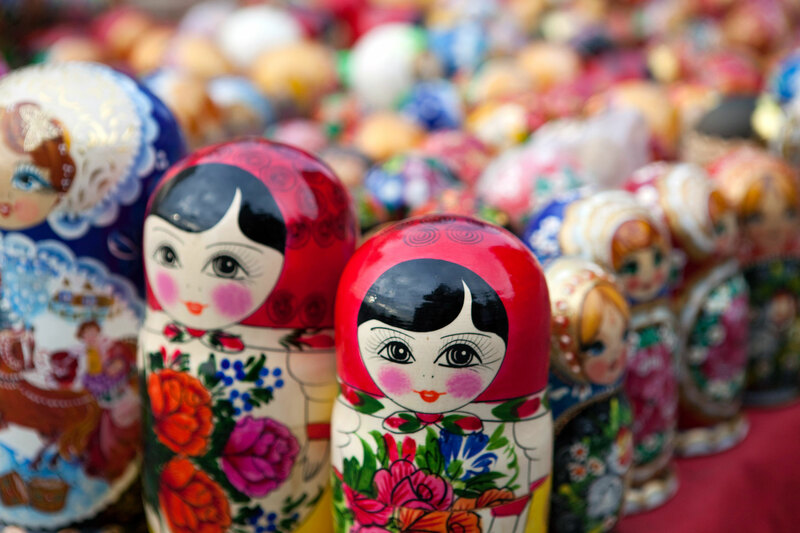 The image that immediately springs to mind when thinking of souvenirs from Russia is that of the ‘Matryoshka’ doll. Visitors will always reach for the layered, lacquered Russian doll to take back with them. However, it turns out that the wooden “matryoshka” may not be an exclusively Russian creation. It is also a lot younger than most people believe. RIR looks into the history of the doll which, like the layered creation, contains several surprises. Step inside any Russian souvenir shop and there they are. Rows upon rows of shining, plump, stylized women; rosy-cheeked, bright-eyed wooden faces, dressed in bright colours and traditional ornaments, will adorn the shelves. Twist the top half off one of these wooden figures and an identical, though smaller replica will emerge from inside. Twist the top off that one and another will emerge from within, and another, and another and inside that, yet another. The Russian doll, or matryoshka, as the Russians call them, is among the most recognizable symbols of Russia. While widely seen as an example of the nation’s ancient traditions of woodworking and decorative handicrafts, the matryoshka is, in fact, far younger than her fame appears to suggest. In fact, the famed wooden doll dates back only to the late 19th century. So what are the origins of this famous nesting doll? The word matryoshka comes from the name ‘Matryona’, which was very popular during that era. The name means "respectable lady," "mother of the family," or "mummy," all of which the benign ‘Matryoshka’ epitomises. "For all Russians the matryoshka is obviously Matryona, the embodiment of woman's health, fertility, a wonderful female disposition and a symbol of the family," explained Yelena Titova, director of the All-Russian Museum of Decorative, Applied and Folk Art in Moscow. But what was the inspiration for the matryoshka? Throughout history the image of the stout and happy woman, the features that characterize the matryoshka, has been used as a symbol of fertility in various cultures. It is enough to remember the Ancient Greek Paleolithic Venuses, the figurines that archeologists found in many European countries, and the Chinese, Japanese and Indian toys that were created with a similar technique. According to one version, a relative of the Russian matryoshka is the roly-poly doll personifying the Buddhist monk Bodhidharma, who was one of the chief mentors of the ancient religion and founder of the Shaolin Monastery. His name in Japanese is Daruma. This name was used for a doll made of papier mache, notable for its solidity. The Kokeshi doll, which served as a talisman for children, is also notable for its resemblance to the matryoshka. However, this Japanese doll bears a closer similarity to Russian straw dolls, which could be found in all peasant homes in the past. The most probable candidate for the title of the matryoshka's older brother is the Japanese elder Fukurumu. Inside this wooden sculpture of the God of Wisdom there were another six figurines painted as his relatives or as other little Japanese gods. Some believe that the prototype of the matryoshka was brought to Russia from Japan in the 1800s by the wife of famous art patron Savva Mamontov. In the second half of the 19th century a vogue for everything eastern swept over Russia: clothes, prints, statuettes. Even Emperor Nicholas II carried a netsuke in his pocket as a talisman. The story goes that Mamontov asked artist Sergei Malyutin to make something similar. However, according to Yelena Titova from the All-Russian Museum of Decorative, Applied and Folk Art, the story is just that and there is no proof that the Russian matryoshka was "copied" from any concrete Japanese brother. "The matryoshka appeared as a result of an artistic project during the Art Nouveau epoch, which involved the use of eastern traditions," said Titova. "The influence of art from the east was definitely significant, but it had a general character." One way or another, the first Russian matryoshka appeared at the end of the 1890s in the Children's Education workshop in Moscow. Its creators were turner Vasily Zvezdochkin and artist Sergei Malyutin. In 1900 the toy was exhibited at the Universal Exhibition in Paris. The colorful doll was recognized as the best dissembling toy both from the educational and the technical points of view, creating a real craze amidst the public and receiving a bronze medal. Before the 1930s painted toys were generally works created by individual artists. The wooden figurines were painted not only by artist-craftsmen but also by representatives of the Russian avant-garde, which was fascinated by the Russian Revival style of the 1800s. In the middle of the 1930s factory production of the matryoshka was introduced, thanks to which it eventually obtained the status of the country's main souvenir. From the 1990s onward the matryoshka in Russia became a unique canvas for the self-expression of various types of artists. All foreign tourists visiting Russia in that period remember the souvenir rows on Moscow’s Arbat with the differently painted matryoshkas representing politicians, pop stars, and actors, sometimes as caricatures. Even today visitors to Moscow and St. Petersburg will find nesting dolls featuring a succession of Russian leaders, from current president Vladimir Putin back to Peter the Great. The doll also underwent thousands of experiments in color, form and size, with the record sample consisting of 80 pieces. "Regardless of all the changes that the matryoshka went through in the years following her birth, which were difficult years in the first quarter of the 20th century, revolutionary years, she became the key element of Russian crafts," said Titova. "There has always been a demand for the matryoshka, both as a children's toy and as a gift, and the doll has always been a symbol of the family."